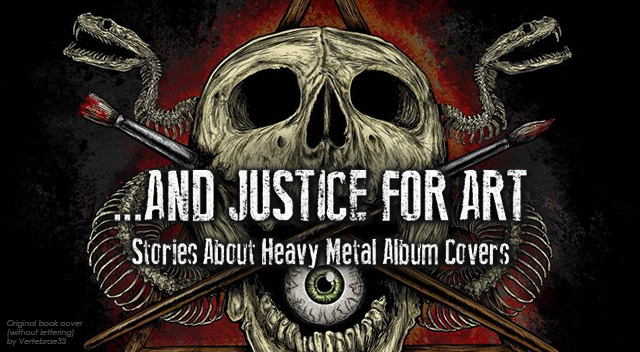 A limited, Revised Edition of the out-of-print book ...And Justice For Art: Stories About Heavy Metal Album Covers" has been released via indie publishers, Dark Canvas. This one-of-a-kind collection of stories features more than 450 color graphics and recounts all the particulars behind the making of artworks as iconic as SLAYER's Reign In Blood, METALLICA's ...And Justice For All, MORBID ANGEL's Blessed Are The Sick, BLACK SABBATH's 13, DEATH's Symbolic, CARCASS' Heartwork, SLEEP's Dopesmoker, TESTAMENT's Dark Roots Of Earth, OPETH's Heritage and many others. These are told through 105 exclusive interviews with heavy music's icons like Jeff Walker (CARCASS), Charlie Benante (ANTHRAX), Max Cavalera (SOULFLY, SEPULTURA), Fenriz (DARKTHRONE), Sebastian Bach (SKID ROW), Paul Masvidal (CYNIC), Chris Adler (LAMB OF GOD), David Vincent (MORBID ANGEL), Travis Ryan (CATTLE DECAPITATION) among many others. ...And Justice For Art has been reviewed by many specialized music publications including USA's Decibel Magazine ("A lush, edifying, fascinating, surprising tour de force history of metal album covers"), UK's Zero Tolerance Magazine ("Meticulously researched, beautifully designed and with a wealth of fascinating and insightful interviews") and Belgium's Rock Tribune Magazine ("It's very impressive, do not hesitate too long if you want to have this book"). The international metal community has also expressed support for the book. For ex-MORBID ANGEL frontman David Vincent (who wrote the book's foreword) "this is a historical document about the importance of Metal album covers." OBITUARY's drummer Donald Tardy, comments that "the world needs books like this. "CATTLE DECAPITATION's frontman Travis Ryan, says: "this is exactly what the music world needs to remind us all just how important album covers have been to all of us that grew up surrounding ourselves with physical media." AT THE GATES' guitarist Anders Björleradmits being "really surprised when I got this book; it's highly recommended!"